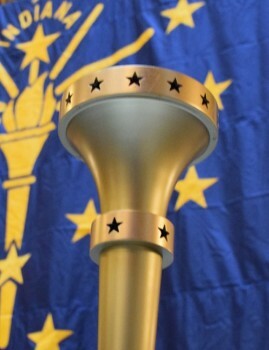 To honor Indiana&apos;s 200th birthday, we’ve compiled a list of unique and inexpensive ways that you can immerse yourself in the Bicentennial celebrations - some without even leaving your home! “A coach with a checkered past and a local drunk train a small town high school basketball team to become a top contender for the championship.” What better way to celebrate Indiana than curling up with a movie that takes place here in the Hoosier heartland? Even better -it’s available to stream on Amazon for as little as $3.99. Love Netflix as much as I do? If you’re looking for your next Netflix binge watch, I suggest The Office. Not only is the show hilarious to watch, but the best part is that you can support Indiana native Jenna Fischer in her role as Pam Beasly. What’s a movie or TV marathon without some popcorn? Pick up some Orville Redenbacher popcorn on your next grocery shopping trip. Not only is the popcorn delicious, but you’re also celebrating Indiana because Orville’s roots trace back to Brazil, Indiana. Painting pottery has always been a fun summer activity. For many years, my family has gone to Kiln Creations in downtown Noblesville. In the spirit of Bicentennial celebration this summer I recommend visiting your local DIY pottery place and painting a cup or plate with a state of Indiana or in yellow and blue, Indiana’s state colors. Get creative! Tweet your creations to @VisitHamiltonCo to inspire others. Looking for a way to brighten up your house? I suggest creating a bouquet with Indiana’s state flowers, the peony. At Seven Sisters florist, a small flower shop in Cicero, you can make your own bouquet or buy one premade. Oberers also has a section of premade bouquets on the website as well as a helpful section on how to make your own bouquet! If you’ve never been to Lisa&apos;s Pie Shop, why not head over for a slice of sugar cream pie, Indiana’s state pie? Be sure to check the website to see Lisa’s full selection of pies. Planting trees is always a good idea, but why not plant a tulip tree? The tulip tree is Indiana’s official state tree. Not only is planting trees great for the environment, but a tulip tree will look great in your yard for many years to come. For more information on how you can celebrate Indiana’s 200th birthday, visit our website and follow @VisitHamiltonCo on social media all year long! Emily Peterson is a Hamilton County native currently studying to earn her undergrad in Political Science from Ball State University. Emily has served in many roles at Hamilton County tourism, from working on the Stats Squad to helping out at Nickel Plate Arts and is spending this summer as the Community Development intern working on all things Bicentennial. Her favorite thing to do in Hamilton County is visiting the Farmers Market with her family. Connect with Emily on Twitter @emily_peterson1 for even more Hamilton County adventures.